Tom Petty and the Heartbreakers had already achieved some success with their first two albums, but it was with their third, Damn The Torpedoes, that they really hit it big. Containing such radio staples as “Refugee,” “Even The Losers,” “Don't Do Me Like That,” and “Here Comes My Girl,” the 1979 LP in many ways remains the band’s defining work. As the subject of the latest installment of Eagle Rock’s Classic Albums series, Damn The Torpedoes is examined in depth by the musicians and studio technicians who created it as well as by other discerning commentators. A typical Classic Albums episode provides a fair amount of back-story to set the album in question into the context of its era and its creators’ career. However, perhaps because the 2007 Peter Bogdanovich documentary, Runnin’ Down a Dream, already covered such ground in detail, what’s presented here concentrates more on the actual making of Damn The Torpedoes rather than the circumstances surrounding it. 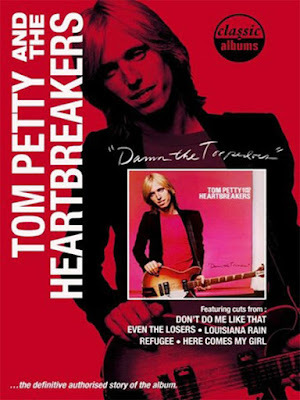 In doing so, Petty recalls plenty of perceptive anecdotes and kernels of wisdom—“I was always good,” he jokes at one point—but the most enlightening insights come from keyboardist Benmont Tench and guitarist Mike Campbell, both of whom are avid students of their musical influences and cognizant of how those influences manifested on Damn The Torpedoes. In one particularly enlightening scene, Campbell demonstrates how he worked from an Albert King riff to craft the basic chord structure of “Refugee,” which (though he doesn’t say so) draws a distinct parallel to Petty and the Heartbreakers’ latest album, the blues-influenced Mojo. What’s most apparent in a general sense, though, is that the band’s ability to deconstruct their own songs isn't in any way compromised by the fact that they wrote them. The bonus material (which runs almost as long as the near-60-minute main feature) continues in much the same vein and is every bit as interesting and informative. Altogether, it makes for one of the best, most informative editions of the Classic Albums series.